Futron was recently awarded a project to design, engineer and support the audio visual, conferencing, and video teleconference capabilities of the Department of Interior (DOI) Office of Emergency Management (OEM) Interior Operations Center (IOC). The IOC is the central point of contact for law enforcement, security, emergency management, and intelligence information. The facility demands IT systems that can deliver real-time situational awareness, collaboration and emergency response. Futron will be applying lessons learned and best practices supporting a range of mission-critical environments in the Civilian and Defense sectors to implement the solution proposed for OEM and deliver a 24/7 environment to drive effective, efficient action. 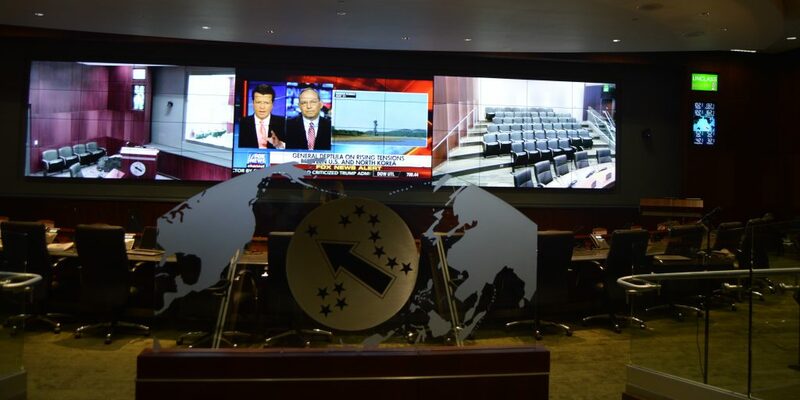 Futron recently completed the installation of this Briefing Room at Fort Shafter in Hawaii as part of our U.S. Army Phase I contract to build out the USARPAC Mission Command Facility (MCF). Futron is proud to continue our support of DOI. Most recently, we successfully completed a recent project upgrading the Director’s Conference Room’s AV system at USGS Headquarters in Reston, Virginia. We installed new systems to support the presentations, VTC, and web conferencing functions of the room. We also complied with ADA (Section 508) compliance regulations. Our team’s revitalization of the IOC will require pre-planning and process considerations given the historical nature of the Stewart Lee Udall Department of the Interior Building where the IOC is located. It is on the National Register of Historic Places, and will require our team’s strict attention to approval processes. As part of our Internet of Things (IoT) practice area, Futron has experience supporting some of America’s most iconic structures by installing security solutions for the Washington Monument and Lincoln, Franklin Delano Roosevelt, Jefferson, and Korean War Veterans Memorials.